Smart City or Sustainable Smart City! “A smart sustainable city is an innovative city that uses information and communication technologies (ICTs) and other means to improve quality of life, efficiency of urban operation and services, and competitiveness, while ensuring that it meets the needs of present and future generations with respect to economic, social and environmental aspects”. Now let’s recap – back to the start of the millennium. From 2000 to 2007 the skyline of Dubai had changed significantly. People were coming from all over the world to live in the “new city”. Opportunities were endless. In January 2007, 80% of the world’s cranes were operating in Dubai. But by December of the same year, 80% of them had stopped working. People abandoned their belongings and left the city in the middle of the night. Cars with keys in the ignition were left at the airport. The Global Financial Crisis hit! That did not stop the Dubai government. The government kept up their momentum and continued its focus on building a robust infrastructure. Singapore, thankfully did not suffer the same fate as Dubai. Singapore’s solid foundation and long term strategy was much stronger. The government was stable with a huge cash reserve and initiatives in place to incentivise their people. Something which Dubai is now implementing. So what does Dubai and Singapore have in common. They have kept the 3Ps in mind. People being the social aspect. Singapore’s drive for a Smart Nation may have been coined in 2014 but the wheels were put in motion over 10 years ago. It’s focus on it’s citizen’s quality of life is of paramount importance. That’s the catalyst, and that’s how it’s described within the top circles of the Singapore Government. Dubai is focusing towards making itself the happiest city by 2017. This will be achieved by making sure the infrastructure works, the city has WiFi connectivity, IoT in place and data available on demand as stated by Dr. Aisha Bin Bishr, SmartDubai Taskforce Leader, Executive Committee (UAE). 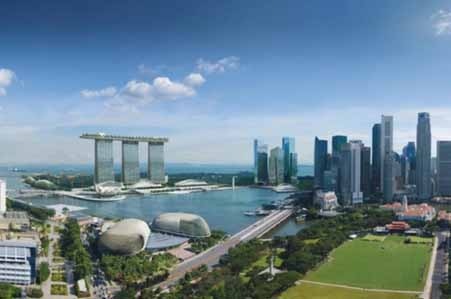 Singapore’s quest on becoming green also dates back for more than a decade. Limiting diesel cars on the island, LTA replacing 500 lights to LED in 2014, and the BCA Green Mark in Singapore. ‘It has universal application anywhere in the tropical belt. More than 250 projects in 75 cities from 14 countries have adopted the BCA Green Mark scheme. They use it to evaluate their sustainability performance and benchmark against one another. ‘ states Khaw Boon Wan Minister for National Development Singapore. Dubai is working on similar strides. By 2030, says the energy report, Dubai will have cuts its carbon emissions by 29%, switched 30% of its $100bn a year economy to renewable energy, ‘clean coal’ and nuclear, and initiated a plethora of energy- and water- saving initiatives. Here, both Singapore and Dubai have been aggressive in attracting business from around the world. Both places being major shipping hubs and respective gateways for trade in their regions. There is no wonder why Singapore and Dubai have been picked to be the pilot the development of Global Smart Sustainable Cities Index by ITU with over 70 indicators. About ITU – ITU is the leading United Nations agency for information and communication technologies, driving innovation in ICTs together with 193 Member States and a membership of over 700 private sector entities and academic institutions. Established in 1865, ITU celebrates its 150th anniversary in 2015 as the intergovernmental body responsible for coordinating the shared global use of the radio spectrum, promoting international cooperation in assigning satellite orbits, improving communication infrastructure in the developing world, and establishing the worldwide standards that foster seamless interconnection of a vast range of communications systems. From broadband networks to cutting-edge wireless technologies, aeronautical and maritime navigation, radio astronomy, oceanographic and satellite-based earth monitoring as well as converging fixed-mobile phone, Internet and broadcasting technologies, ITU is committed to connecting the world.